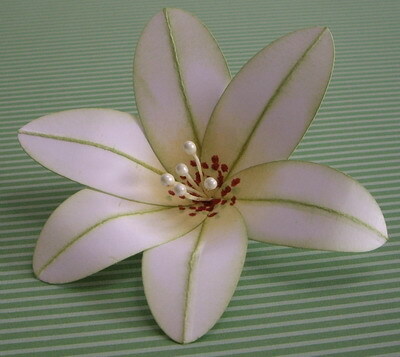 Today I visited Valita's website (Valita's Fresh Folds) and watched her video on how to make a 3-D Lily. After watching the video, I had to give it a try. I used some pearl "stamens" that I purchased from Cherish the Thought in Coquitlam, rather than making the stamens in the video. I also added a few Cajun Craze dots at the center of the flower so that it looks just like my Casablance Lilies that I grow each year. This was fun and easy to make and would be a beautiful embellishment on a gift. Hope you like. I followed Valita's instructions on how to make the 3-D lily - click here to view. Yesterday I had two friends, Liz and Patt, over for a "High Tea". We enjoyed tasty treats and had a wonderful visit. Thanks Liz and Patt for coming over - it was so much fun!! Here's a few pictures I took of our High Tea. Oh, Loll, I love high tea and yours looks fabulous! You must be one fabulous cook and talented baker! My favourite high tea in the Vancouver area is The Secret Garden in Kerrisdale - if you love high tea, you should try it some time. 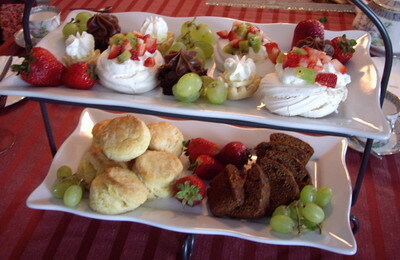 Your high tea looks like it was a total success! Love the card too.